A timeline account of the day. Relentless riot police attacks with teargas, physical violence and even rocks. Hundreds of injured demonstrators. Square raided but not evacuated. The second day of the General Strike in Greece was also the day the mid-term programme would be voted: A programme of austerity that everyone knows will bring even more impoverishment to the working class and proletarianised petty bourgeoisie, while ratifying the wholesale sell-off of public assets. This day was meant to be the culmination of resistance, and it was drowned in teargas even earlier than the mid-term was passed in parliament. The demonstration started large, but after relentless brutal attacks with teargas, physical violence and even stones, only a small core of people remained in Syntagma square. Rioting by a younger section of the demo was the response to police repression and to the vote and continued until late into the night, with a small core of demonstrators remaining to keep the square. 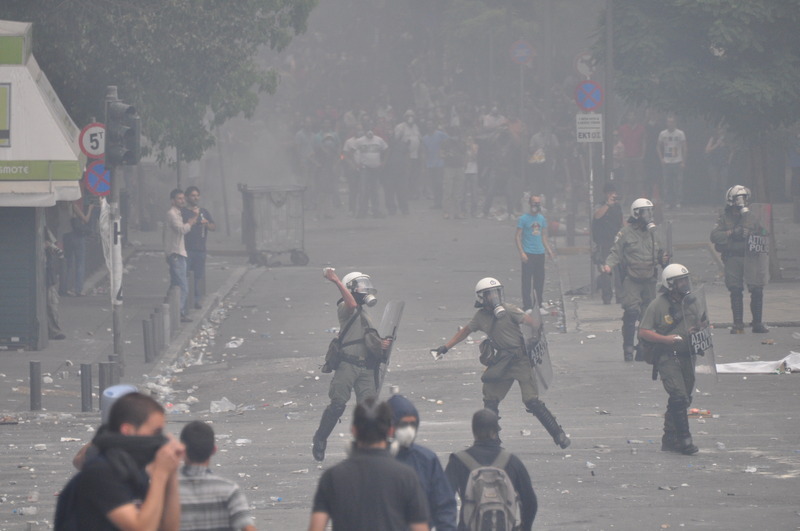 The Syntagma square occupation was rebuilt by Thursday midday. 9:30 Police attack on bloc at Hilton video. Syntagma is resounding with jeers and and anti-IMF, anti-parliament, anti-Memorandum slogans. Things being said on twitter "Don't be surprised, the next time a riot cop is torched even the trees will be celebrating"; "The only thing they are achieving by throwing so many chemicals is people's genetic modification - the sheep will become wolves!" "What we have here is STATE TERRORISM in all caps. Until yesterday I thought troublemakers were making a mistake, provoking riot police. I no longer believe this." "Arseholes! Cops ONCE AND FOR ALL! No excuses from cops' mothers any more! The are NOT doing their job! THEY ARE TORTURERS!" "SInce they are not letting people demonstrate peacefully nobody can say anything now for anything that happens from now on" "You who take away my right to demonstrate peacefully and throw chemicals at me for hours, don't you talk about democracy. Bloody FASCIST!" "And for me composure has ended. The police are cops. The MPs who voted next door to chemical suffocation are subhumans" "Let's say it: throwing stones, bottles etc towards riot police is no longer 'troublesome' behaviour. It is generalised"
6:15 Teargassing of the square and stone throwing bt police and protesters continued. Now police encircling Syntagma possibly in order to arrest all the remaining demonstrators. Yet more teargas. Photos in the Guardian show police violence.